The ECN Data Centre manages an integrated information resource, which stores all data and meta-data collected by the networks which supply data to it. These data are held in standardised structures in order to support the cross-disciplinary analyses necessary for environmental change research. 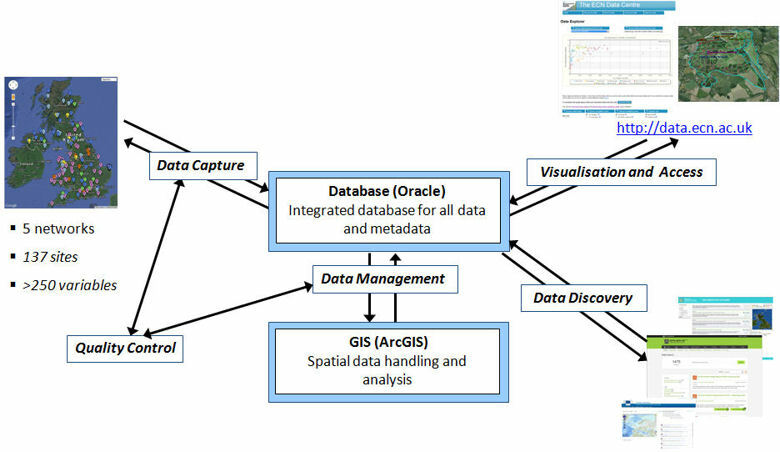 The database uses the Oracle RDBMS with links to Arc GIS for spatial data handling. Data are regularly sent in from sites and are quality assured before being lodged in the database; a system of quality flags and codes ensures that the data are properly qualified in the meta-database. Availability of data is central to the ECN Data Centre's success as a resource for environmental research, policy purposes and public information. We promote the use of the data we manage through a number of different data access methods, including targeted data products, web developments and events to suit a range of users from scientists and policy-makers to students and the general public. Data are made accessible according to the ECN data policy. The ECN Data Centre website provides a gateway to ECN data access. Rennie, S. (2016). Providing information on environmental change: Data management, discovery and access in the UK Environmental Change Network Data Centre. Ecological Indicators, 68, 13-20. DOI: 10.1016/j.ecolind.2016.01.060. Detailed documentation is also available on the structure of the database.